Much of the overall decline of our collective intellectual culture involves the breaking-down of things into constituent parts. Detail is studied at the expense of any overview and discussion often centres around which label or classification can be applied to an idea or a thinker, rather than on their actual content or significance. Anarchism can present problems for those who operate within that mindset, as it reaches deeper than the superficial level of other “political” ideas – it provokes with paradox, combines apparently contradictory concepts at higher levels of abstraction and refuses to be contained by the assumptions of one-dimensional theorising. 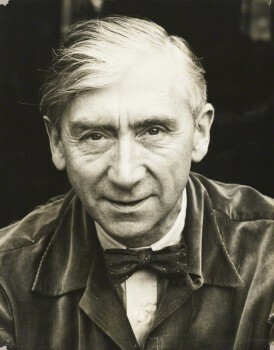 The great 20th century English anarchist Herbert Read was an excellent example of the multi-dimensional complexity of the anarchist mind, which is perhaps why he today does not always receive the recognition he deserves, despite his unusual record of having been a towering figure of the modern art world and also a vocal advocate of anarchism. Happily, this neglect is now showing signs of being remedied. Following the release of Huw Wahl’s fascinating documentary film To Hell With Culture, The Orage Press has published a study of Read by Dr Michael Paraskos. Herbert Read: Art and Idealism makes no futile attempt to flatten out Read’s work and life in order to make it fit into some pre-determined category. Instead, Paraskos skilfully shows the interweaving threads of Read’s artistic and anarchist positions, demonstrating how his approach to thought was itself a part of his philosophy. He writes: “Read’s tendency was always to synthesise ideas from diverse sources, hybridising them into new forms, some of which the authors of his original material would undoubtedly have rejected… Read began to develop a theory of culture that was re-integrationist or synthesist”. In the field of art criticism, Read worked to transcend the false polarity between classicism and romanticism, which manifested itself at the time as the divide between, respectively, Constructivism and Surrealism. By championing both movements, he inevitably also partly alienated each of them, but this did not deter him from his creative approach. Read’s non-aligned position was not the result of indecision, or of some desire for middle-of-the-road compromise, but for a synthesis that transcended a superficial division. It was this same seeking-out of higher levels of understanding that enabled him to embrace modern art while despising modern industrial civilisation, or to draw inspiration from both John Ruskin and Friedrich Nietzsche. This attitude also informed his own version of existentialist thought, as Paraskos explains: “Read suggested that like all humanity the existentialists stood on the edge of an abyss facing the truth of their own insignificance. Whereas most of humanity was oblivious of the abyss, the existentialists recognised their situation and were overwhelmed by Angst. This Readian existentialism amounted to the message that “the transformation of society depended on an absolute individuality based on absolute responsibility for one’s own actions” – the core of the anarchist philosophy of resistance. Paraskos stresses that Read’s thinking about art and philosophy cannot be separated from his anarchism and that he was involved in “an attempt to reconcile the material, or we might say physical, philosophy of anarchism with the seemingly immaterial, or metaphysical, philosophy of idealism”. The importance of this task remains acute today, when too many anarchists fail to understand the ways in which their philosophy reaches out beyond mere political theory towards an holistic metaphysics. The idea of inherent form, which fascinated Read and which links in with his interest in Jungian theory of archetypes, is a bedrock of coherent anarchist philosophy and yet seems to be little appreciated. It was in the nature of Read’s philosophical journey that it would never – could never – be completed. But if 21st century anarchists care to take the time to study his journey, and contemplate his approach, they may well discover the urge to step off the well-trod road of narrow thinking and forge their own path of empowering intellectual discovery. This book is a very welcome and pertinent encouragement of that process. I’m indebted to Gabriel Kuhn for the very positive review of The Anarchist Revelation he has posted on the Alpine Anarchist Productions website. Gabriel is well known to English-speaking anarchists for the likes of Life Under the Jolly Roger: Reflections on Golden Age Piracy (2010), Soccer vs. the State: Tackling Football and Radical Politics (2011), and for editing and translating Gustav Landauer’s Revolution and Other Writings (2010) and Liberating Society from the State and Other Writings (2011) by Erich Mühsam. His German-language works include Tier-Werden, Schwarz-Werden, Frau-Werden. Eine Einführung in die politische Philosophie des Poststrukturalismus (2005) and Neuer Anarchismus in den USA. Seattle und die Folgen (2008). Publications on anarchism have been thriving since the early 2000s. Yet, there is still a place for surprisingly unique releases. Paul Cudenec’s The Anarchist Revelation, recently published by Winter Oak Press in England is one such example. The book attempts no less than equipping contemporary anarchism with a footing that is often neglected: the transformation not only of society’s structures but also of people’s souls. In order to achieve his goal, Cudenec embarks on a daring journey through the history of ideas. The list of references is long: Taoism, Sufism, the Bhagavad Gita, Nietzsche, Hesse, Huxley, C.G. Jung, Marcuse, Baudrillard, Zerzan, to name but a few. This alone will be reason enough for some folks to be skeptical: the list includes many non-anarchists, the danger of romanticizing non-Western traditions is evident, and when the likes of Oswald Spengler pop up, a fear for reactionary ideas corrupting a presumably progressive treatise is never far. Make no mistake, though: this is no hodgepodge of random notations, and no new age hocus-pocus disguised in anarchist colors. Cudenec’s text is well-structured, consistent in its arguments, and manages to address poetry, mysticism, and spirituality without regressing into lofty gibberish. It is never in doubt that the book is a serious attempt at helping us answer the ever relevant question of whether life can change with a rearrangement of social institutions alone, if we don’t change as human beings. To speak of an “authentic core of our existence” or, as Cudenec does on other occasions, of a “human archetype” (19) or the possibility of failing to become “all that nature intended us to be” (25) easily evokes accusations of essentialism. Yet, if we look beyond the terminological difficulties, an important question is raised here: What is it that we, as anarchists, actually want and need? In the end, only an answer to this question can lay the foundation for the communities we are seeking. Paul Cudenec’s work will mostly appeal to those who – in increasing numbers – explore the relations between anarchism and philosophy, psychology, and religion. People looking for in-depth analyses of governmental bodies, labor conditions, or gender and race relations might have to turn somewhere else. No single book has it all. The Anarchist Revelation has a clear purpose, however, that is, reflecting on the transformation of the self for the benefit of the community. Everyone interested in this mighty challenge will find the text to be an inspiring read.